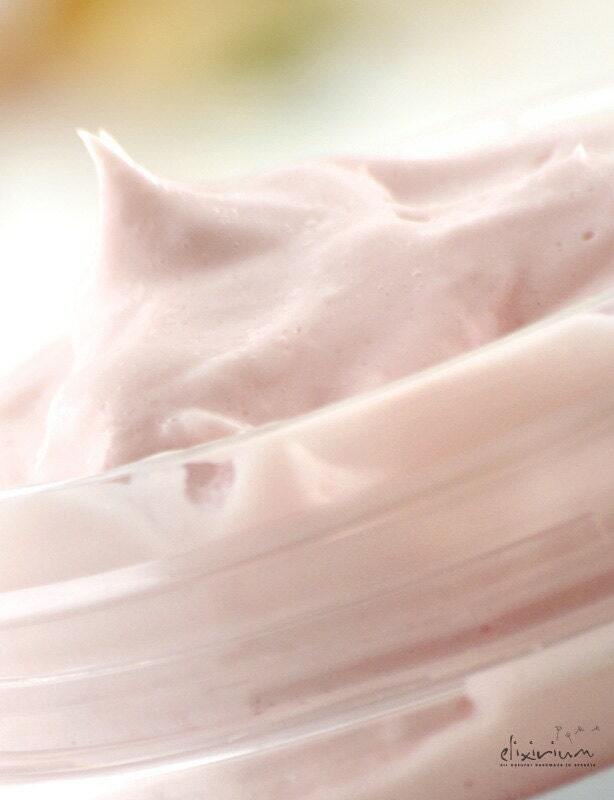 • Hydrate your skin and make it glow with the power of Organic Rose & Rosehip. ► DETAILS : Keeping your skin hydrated is one of the fundamental ways to keep it fresh and wrinkle free. 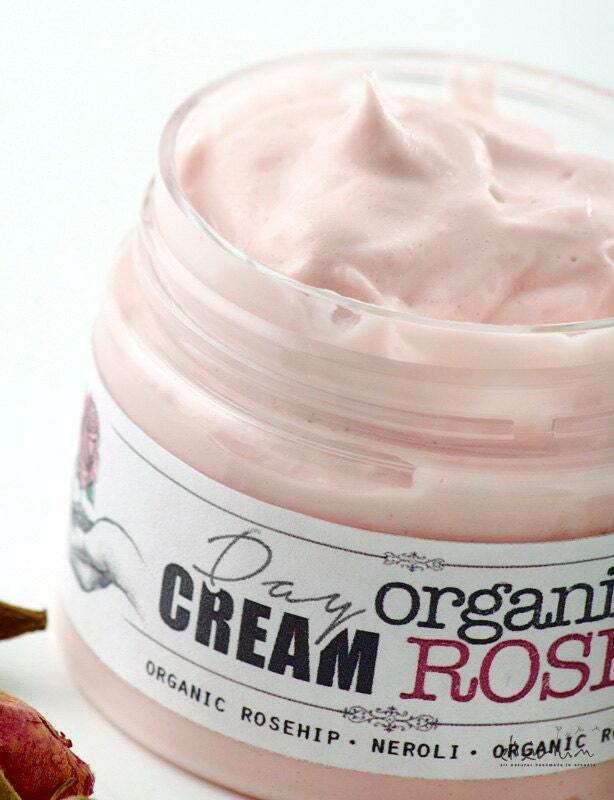 ORGANIC ROSE DAY CREAM is a moisturizing formula for day time use. It is suitable for all skin types. Ideally you put it on in the morning, and you may repeat application later in the day if you feel your skin needs more hydration. Based on Galien's original ancient formula, It is leaving a cool feeling and getting quickly absorbed on your skin so you can proceed to your usual makeup routine after application. It can also be used as a de-make up cream at the end of the day. 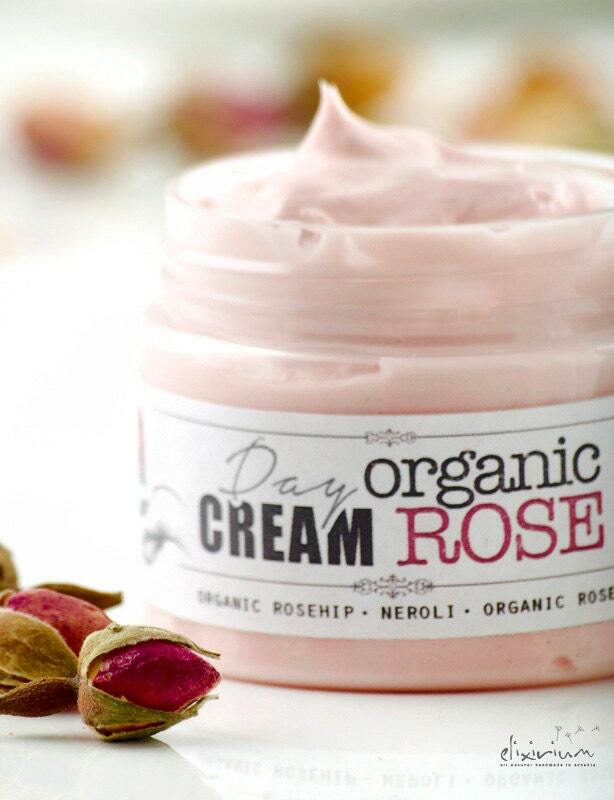 Organic Rosehip and Rose as this cream's base ingredients, are well known for their anti-aging properties and ideal for complexion tissues regeneration. They promote skin healing and dramaticaly increase collagen and helastine levels of the skin. They battle free radicals and protect complexion from premature aging. 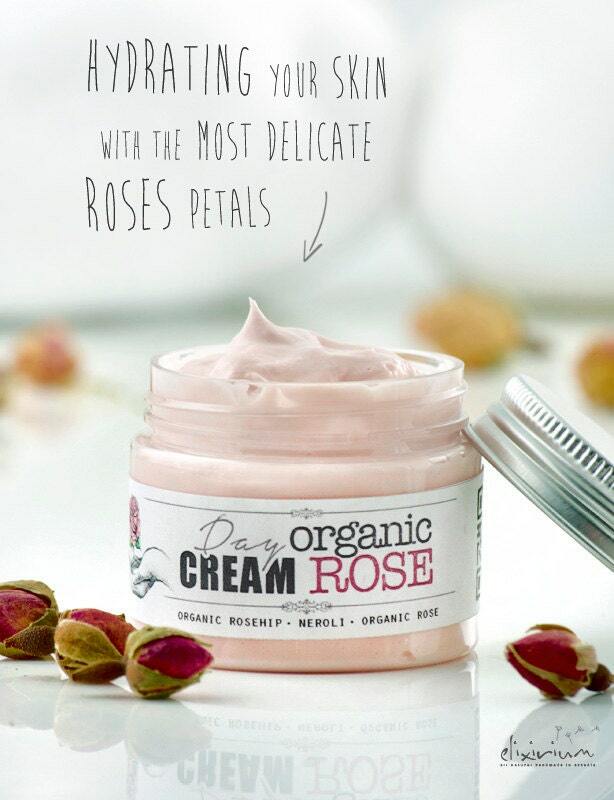 All these incredible benefits of Rose and Rosehip derive from their high levels of vitamin A, fatty acids like omega-3 and omega-6 and vitamin E.
More than Rosehip, this formula contains many more essential and organic oils like almond oil, appricot kernel, achillea oil and more, to add to and complete the beneficial properties of the cream. 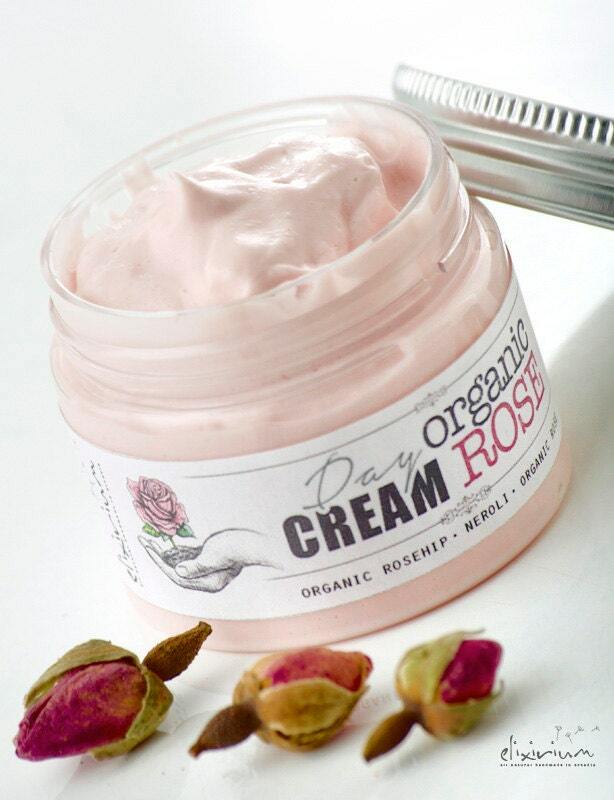 The ORGANIC ROSE DAY CREAM is ideal for facial, neckline, bust and breast use, leavibg your complexion fresh, silky and vivid glowing. 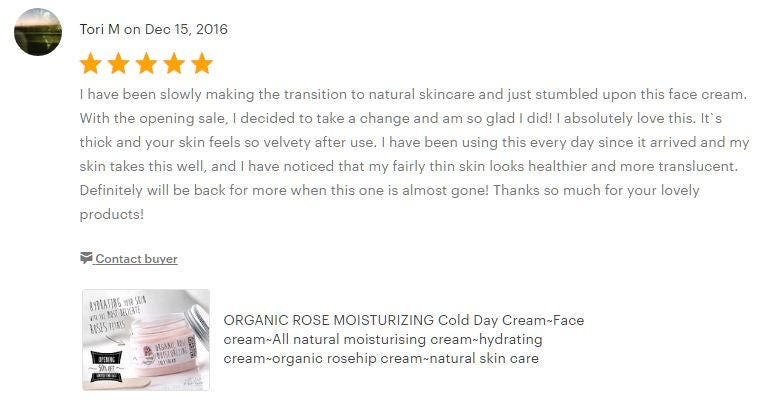 It can be perfectly combined with elixirium's ORGANIC ROSE FACIAL TONER ( http://etsy.me/2frXmPn ) for toning, balancing and total skin hydration. ► INSTRUCTIONS : Apply a small amount of cream with circular movements on your skin. Use the enclosed in packaging wooden stick applicator if you like not to contaminate the rest of the cream with your fingers. Rub gently until your skin absorb the cream. ►SHELF LIFE : Elixirium products are pure and absolutely preservatives-free so for optimal results use it up to 12 months from production date indicated on the bottle. All ELIXIRIUM products are handmade by me after your order so always arrive at your hands all fresh. Feel free to contact me for any questions ! This is a lovely product, I will order again. Great service. This is my absolute go-to moisturiser. I use this as my day and night moisturiser in the warmer months, and then interchange with the mastic night cream during the winter. My skin loves this rose day cream so much though. I find it softens and evens out my skin tone, and never feels greasy or overbearing. The scent is light and elegant, and it speeds into my skin for fast and lasting hydration. If this ever goes out of production, I will be lost! This face cream is perfect, it's hydrating but not heavy, perfect for day time! The smell is soooo good, strong but not too sweet! The parcel arrived in time, and it was super cute! So perfect! My skin is velvety and smooth. Works great on elbows and knees too!